At Fife Kickboxing we want to help all of our students develop and grow, not only as martial artists, but as individuals. In a supportive environment we strive to develop self-confidence, ambition, self-belief and a "CAN DO" attitude in all our students. Everyone is encouraged to push boundaries and train hard. 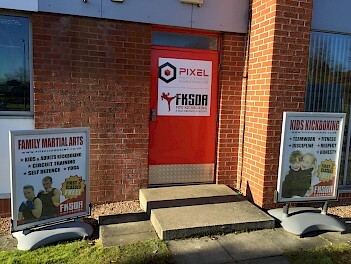 If you want to be part of a tight knit, friendly and community spirited club we invite you to come along to FKSDA Martial Arts Studio and meet our Instructor Team. Whether you are looking to lose weight, get fit, or just try something new the instructors at Fife Kickboxing are there to motivate and support you towards achieveing your Black Belt ambition. Please check out our Facebook Page for more information on the club or to ask us a question. We are located in the Fife Group building just off Queensferry Road - CLICK HERE for Google Maps.